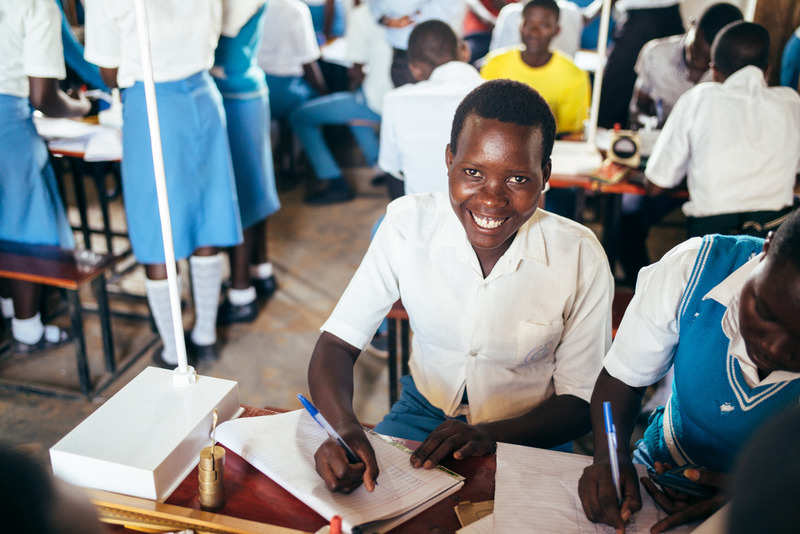 Photo: A girl attends physics lab at our rural high school, a chance most rural Ugandan girls would rarely have. The school recently started its 11th year of classes. 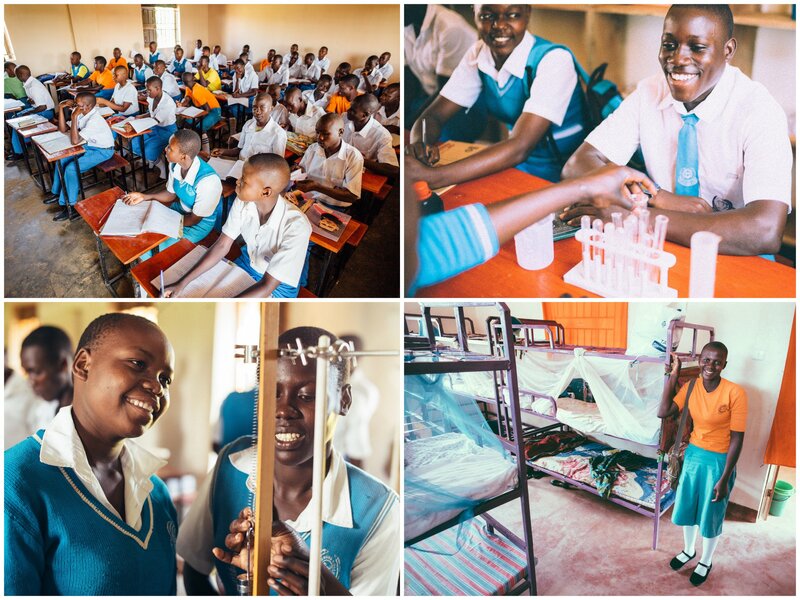 Today we bring you an update about the history and recent progress of our high school in rural Uganda. The idea for a high school was birthed when, burdened by the alarming rate of rural students suspending their education after 7th grade, our local director, Pastor Frank, knew that the key to breaking the cycle of poverty was to offer these students a way to reach a higher education in a rural setting. Using some land inherited from his parents, he endeavored to launch a private rural high school that would offer a quality education at an affordable price. In 2004, a simple outline of the foundation to the original high school building was laid with the strong belief that funding would be provided miraculously in the future to complete the building. So the dream began with a simple supply of bricks, concrete, and mortar provided by local donations and volunteer labor. Meanwhile, despite funding challenges, in 2007 classes began with a few local students in a makeshift one-room shelter with dirt floors, a tin roof, and repurposed lumber slats as walls. Simple benches provided students with a place to sit, merely keeping school books in their laps as they attended classes. Then in 2009, Peace Gospel entered into a humble partnership with Pastor Frank to help him reach his dream of completing the high school. Since that time, over half a million dollars has been invested into the property, hundreds of scholarships, operating expenses, an adjacent farmland enterprise, a clean water well, and an on-campus clinic that doubles as a medical outreach to the community. In addition, the campus also serves as an orphan home to several orphaned students living on campus and attending classes on scholarship. Pastor Frank and his wife, Susan, adopted several of the orphan students in the early years, and many are now grown and have gone on to attend university in Kampala or abroad. Photo inset: (Top-left): We are thankful that the school year is off to a great start with 300 students enrolled, our highest enrollment to date. (Top-right): Our students enjoy a well-rounded school curriculum, studying math, English, geography, history, commerce, chemistry, biology, fine art, economics, agriculture, computer studies, Biblical studies, and their native language of Swahili. (Bottom-left): Students enjoying physics lab at the high school. (Bottom-right): This girl is thankful that our high school campus also serves as an orphan home to several orphaned students, such as herself, living on campus and attending classes on scholarship. Today, several construction projects later, our rural high school program has achieved the highest honor in Ugandan high school education; it has been granted accreditation by the Ugandan Ministry of Education, and furthermore, has achieved a “Center Number” which is a permit that grants the school the ability to offer testing facilities for students of other non-accredited high schools. Thus, the campus has become quite acclaimed in the Mayuge District as one of only nine accredited high schools serving a population of 600,000. The campus consists of several facilities: the original school building which also doubles currently as the boy’s dormitory, an administration building, the newest building which contains seven classrooms and more teacher’s offices, the medical clinic which has given one wing to also serve temporarily as the girls’ dormitory, a kitchen building, a canteen which sells the students basic school supplies and snacks, and finally, a parsonage home for Pastor Frank, his wife Susan, their three biological children, and their nine adopted children. Our high school is now accredited whereas many schools in the area are not accredited. Our high school has a “Center Number,” which many schools in the area do not have, and it enables students to take their national exams on the school premises, saving us money that would be spent by taking candidate students to other schools for their national exams. Our high school has a perimeter fence for the students’ security unlike other schools in the area which have lower security. Our school has solar power, a generator, and electricity which enables students to read at night, and to have access to practical electric appliances. Sadly, many schools in the rural areas do not have such amenities. Our school emphasizes good discipline and instills Godly principles in order to produce well-balanced, healthy students. Our high school is located in a rural area, which provides a better learning environment without all the distractions of the schools in the busy cities. Our high school is located on six acres of land used for sporting events and outdoor gatherings. Of the nine accredited high schools in the region, we have the most qualified staff (22 teachers and 7 supporting staff members). Photo inset: (Top-left): We are grateful to have partnered with our local director, Pastor Frank, to fulfill his vision of offering students a higher education in a rural setting, thus breaking the cycle of poverty. (Top-right): Our students are thankful to learn under the most qualified teaching staff in the region. (Bottom-left): 40 of our high school students were very honored to be invited to sing at the Ugandan president’s visitation rally this week. (Bottom-right): Our students enjoy playing volleyball and soccer for their physical education. Our high school is in its 11th year of operation, and following the Ugandan school year, which began in February, this semester is off to a great start with 300 students enrolled, our highest enrollment to date. They are flourishing in their studies of math, English, geography, history, commerce, physics, chemistry, biology, fine art, economics, agriculture, computer studies, Biblical studies, and their native language of Swahili. Our students also practice debating skills every Friday, they participate in soccer and volleyball for their physical education, and they are encouraged to speak in English as all of their school subjects are taught in English. Through all of these programs we hope and expect to see our students excel in their education, empowering them to live out a hopeful future. In other good news, 40 of our high school students were asked to sing at the President of Uganda’s visitation rally this week. The Ugandan president visited the rural area of Mayuge because he has established a retreat residence in the town where our school is located. This is the second time our students have received this great honor as they were asked to sing at the president’s rally last year as well. We look forward to reporting back about the continued education of our high school students, and other good news to come from our native team in Uganda. We are thankful for your generous support which makes these education programs possible, blessing the lives of our students and the people in our community.